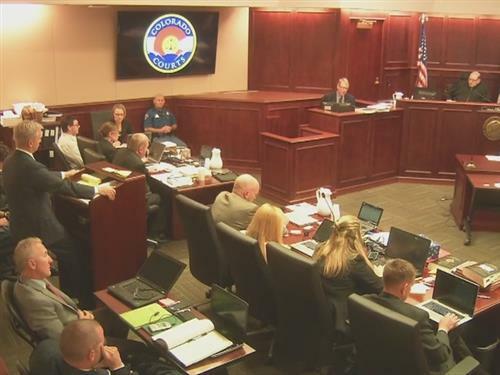 Aurora movie theater shooting trial day 39: The defense may introduce new jail video. 7NEWSDr. Jonathan Woodcock faced a feisty and even angry district attorney during his second day of testimony on Friday. Morning all. I think he was better for the prosecution than for the defense. Was thinking about something. Was wondering if defense might save Dr. Gur for last, if she's suppose to be such a strong witness, in order to try to leave her testimony in their minds. Got pretty ugly in here Anica. Dr Woodcock was terrible. He didn't seem to take much time at all to render his opinion. He didn't look at all the facts. And on the stand he was evasive. @anica - Not impressed. Dr. Reid was far more engaging and handled questioning skillfully. So quick question - someone mentioned that the defense wanted the judge to recuse himself at one point? I searched but could never find anything on this... anyone have any info? Good morning, all! I think Dr. Woodcock tried to say exactly what he was paid to say, and that he had no idea how to deal with DA George Brachler. Good Morning All! @Anica...he was very flustered in his answers, gave a ton of information that didn't pertain to the question and kept trying to prove he was right with his insanity opinion. Good Morning Anica and all! @bob - agreed. He was resistant to answering Brauchler's questions, but had no trouble answering King's. He was either REALLY coached or REALLY bad as a witness. I honestly though there were times Dr. Woodcock was gonna cry during cross exam by AC. Hope your watching this Anic!! Good morning all. Dr Woodcock seemed to have a horrible memory when it came to GB's questions but a good memory when it came to King's questions. @ Anica - I think he was not a good witness for the defense. He seemed like he just was there to say JH was insane, but really didn't do a proper examine of JH. This part of the replayed testimony is so painful to watch because the Dr. skirts around everything that Brauchler asks him. Even the Judge seemed irritated with the Doc. @anica What's is our new little icon for? Just to the left of the heart to like a post? @NT8...hahahaha! I think you are correct in your statement! @NT8 agreed! The judge seemed as frustrated as AC about this doctors inability or unwillingness to answer his questions. @ Lori I was just about to ask the same question. AURORA | "The judge in the Aurora theater case today rejected a defense request for him to step down as judge in the case. In a ruling handed down and released Friday, Judge Carlos A. Samour, Jr. said he would not step down from the case and said the defense has misconstrued his blunt approach as being hostile to their side. Lawyers for accused theater shooter James Holmes had asked Samour on Thursday to step down, arguing that he has been hostile to the defense and personally attacked them in some of his orders." Wonder if any of these lawyers are married and how they maintain those with all of the extra hours they have to put in. Good morning everyone! Looks like I missed an intense Cross by AC to Dr. Woodcock Friday. King's livin' La Vida Loca today! If you click on the comment thingy, it puts your comment under the comment you are answering. Then to get out of that mode you have to go back to the top comment bar to get back to normal. looks like King has the ricky martin suit on again ?